We’re big fans of the OnePlus 3, a phone which combines flagship specs with a more than reasonable price – but it’s not perfect, and there’s likely still a long wait until we see the OnePlus 4. In the meantime though we have the brand new OnePlus 3T, which seems to be the OnePlus 3.5 in all but name. It’s an odd move from a company which usually only launches one phone – and certainly only one flagship – each year. But just how different is it to the 3? And is it worth buying, or should you wait for the OnePlus 4? We’ve put the OnePlus 3T up against the OnePlus 3 to answer those questions. You’ll struggle to tell these two phones apart just by looking at them, as both are crafted from a single slab of aluminum, and they have the same dimensions and weight, at 152.7 x 74.7 x 7.35mm and 158g. They sport a premium, if not particularly original, design, with gently curved backs and edges, designed to help the OnePlus 3 and OnePlus 3T sit comfortably in the palm. The main visual difference is the color scheme, with the OnePlus 3 available in graphite or soft gold, while the OnePlus 3T is launching in gunmetal and soft gold. Despite rumors that OnePlus was switching to an LCD display, the OnePlus 3T has launched with an Optic AMOLED one, just like the OnePlus 3. Both screens are 5.5-inch, 1080 x 1920 affairs with a pixel density of 401 pixels per inch, both are clad in tough Gorilla Glass 4 and both have tiny 0.755mm bezels. In both cases you can expect a vibrant screen, and both use a dual-polarizing layer, which is designed to make the display easy to see in bright sunlight. Based on our experiences with the OnePlus 3 it’s a good screen, but if you were hoping for a jump in resolution or other improvements you’ll have to wait for the OnePlus 4. This is one of the biggest areas of difference between the OnePlus 3 and the 3T, as while the OnePlus 3 has a Snapdragon 820 processor with a clock speed of up to 2.2GHz, the OnePlus 3T has a Snapdragon 821, clocked at 2.35GHz. Both of those are powerful chips – the 820 is found in many of 2016’s flagships, including the HTC 10 and LG G5, but the Snapdragon 821 offers a 10% performance boost according to Qualcomm. OnePlus claims its new phone also has an upgraded file system algorithm, which supposedly improves the launch speed of large apps and games. There’s no change in RAM, but there doesn’t need to be, as both the OnePlus 3 and OnePlus 3T have 6GB of the stuff, which is more than almost any other smartphone. Both phones run OxygenOS, which is based on Android Marshmallow, so there’s nothing to choose between the 3 and 3T here. OxygenOS doesn’t stray too far from stock Android, but it’s slightly more customizable and adds a handful of extra features, like ‘Shelf’, which is a separate screen, away from the main home screens, that can house favorite apps and contacts. For those looking for an upgrade to Android 7 Nougat, OnePlus says it will roll it out to both phones by the end of 2016. The OnePlus 3 and OnePlus 3T have the same rear camera – a 16MP Sony IMX 298 sensor, with phase detection autofocus, optical image stabilization, 4K video support and the ability to shoot in raw format. It’s a solid camera, but not a match for the best smartphone snappers around. While you shouldn’t expect better performance from the OnePlus 3T’s camera it is at least more durable than the OnePlus 3’s, as it’s protected from scratches with a layer of Sapphire glass. The big change is around the front, as while the OnePlus 3 has an 8MP front-facing camera, the OnePlus 3T has a 16MP one. OnePlus claims the upgrade allows for clearer photos and videos, even in low light. The OnePlus 3 has a 3000mAh juice pack, which, while not awful, struggles to last beyond a day. The OnePlus 3T improves things with a 3400mAh battery – that’s a 13% increase. Both phones support Dash Charge, which not only allows for very fast charging, but shifts most of the power management processes from the phone to the plug, so your handset doesn’t heat up too much. As a result, the OnePlus 3 and OnePlus 3T can also maintain their high levels of performance while fast-charging, rather than having to throttle the power to stop them overheating. Both phones are available with 64GB of storage, but in the OnePlus 3T’s case you can also get a 128GB model – though only in gunmetal. That’s handy, because as with the OnePlus 3 there’s no microSD card slot here. 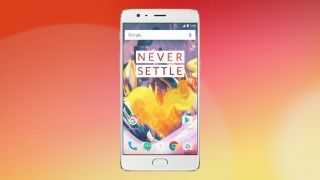 The OnePlus 3 costs $399/£329 (around AU$550), while the OnePlus 3T is launching in the US on November 22 and in Europe on November 28, with prices starting at $439/£399 (around AU$650). That’s not cheap, but still significantly undercuts most high-end phones. The thing is, OnePlus isn't producing any more 3 handsets, so once the current stock is gone, it's gone; very soon, only the OnePlus 3T will be available to buy. There was never any question as to which of these two phones is the best: it’s the OnePlus 3T, at least on paper, but it looks to be a very modest upgrade and it carries a higher price tag. The main changes are a slightly faster processor, a bigger battery, an upgraded front-facing camera, and more storage – but you’ll pay extra for a higher-capacity handset. The 3T is clearly not worth buying if you already have a OnePlus 3, but if the improvements make a tangible difference then it could tempt those who weren’t quite sold on the company’s last phone.